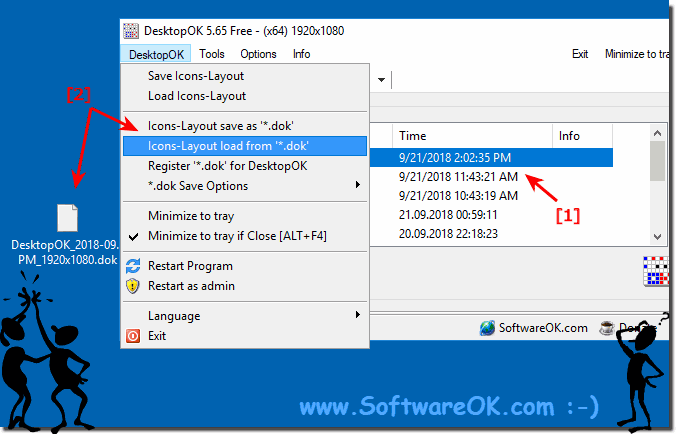 The Difference between Save Current State and Save Current State at Desktop Item in DesktopOK ! (Image-1) Save Current State and Save Current State at Desktop Item! Even though the Windows desktop has been constantly improved and new features added, just experienced users will miss useful features and the ability to customize their workspace. This tool is the best way under Windows professionals to optimize the functionality and efficiency of all windows desktops, without switching to a clean and completely different system like Linux, Android or MAC OS. The variety of features, shortcuts and settings certainly requires some training, but should fast and quickly lead to more Efficiency and Effective work on the desktop and open up new possibilities for the user for a better work on the Windows system. DesktopOK - FAQ-15: Difference between Save Current State and Save Current State at Desktop Item?